Hollywood Stands Up To Cancer, presented by the Entertainment Industry Foundation (EIF) and chaired by Jim Toth and Reese Witherspoon, took place in Culver City, CA, on Wednesday. The event was hosted by James Corden and featured a performance by John Legend and special guest Common. Among the stars who attended were Robert Downey Jr, Camila and Matthew McConaughey, Eva Mendes, Jesse Tyler Ferguson, Tony Hale, Marg Helgenberger, Dan Bucatinsky, Katee Sackhoff, Karl Urban and Stacy Keibler. 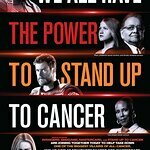 Between gifts from major donors and ticket sales, more than $16 million was pledged in connection with the 2015 event to fund Stand Up To Cancer's innovative research including its support of The Jim Toth Sr. Breakthrough Lung Cancer Research Award established last year. Each year, Stand Up To Cancer recognizes one of its generous corporate donors for their support. This year, Co-Founder Katie Couric honored Visionary Donor, MasterCard, which has committed more than $25 million since the formation of SU2C and announced a new donation of $10 million to support SU2C’s innovative cancer research programs. Additionally, a $6 million grant from The Lustgarten Foundation will be combined with funding from Cancer Research UK (CRUK) for a new three-year, international pancreatic cancer dream team with SU2C. The event was produced by Yifat Oren & Associates and Don Mischer Productions in collaboration with the Entertainment Industry Foundation.